Crazy, right? But even if one tries to minimize dependence on this model by limiting grocery store shopping in lieu of Community Supported Agriculture and Farmer’s markets, it can’t be totally avoided. We live in Manhattan. It’s an island. Everything in our kitchen had to be brought here one way or another (see nos. 3, 5, 7, and 9 on the diagram). That is, unless we were to grow it right in our proverbial “back yard”. So, what would it take to support our family of four locally? Well, according to The Remote Gardener, about 2 acres! Of course, Despommier’s vertical farm is still theoretical and has its detractors, but it is an extremely compelling idea and you can see designs for what the buildings would look like here. Wouldn’t NYC be that much more gorgeous if it was sprinkled with giant greenhouses? What better way to put to use all of those crazy glass highrises in Manhattan and Brooklyn built during the recent real estate boom, many of which now appear to be vacant. Would it be possible to build a “mixed use” building that both houses people and feeds them? 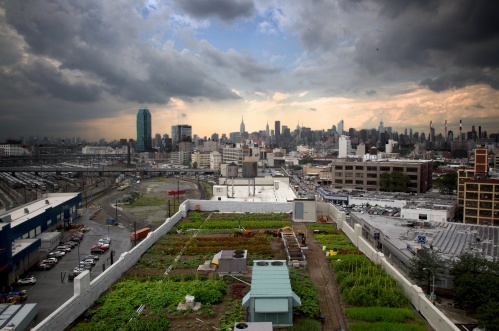 Eagle Street Rooftop Farm is a non-profit organization that runs a 6.000 square foot farm in Greenpoint Brooklyn that was designed and installed by Goode Green and is run by founding farmers, Annie Novak and Ben Flanner. It is run by interns and volunteers and hosts a number of community educational programs. It’s produce supplies a CSA, area restaurants, and a local farmer’s market. Brooklyn Grange is the largest commercial rooftop farm in the world with a 40,000 square foot farm in LIC, Queens and a new 45,000 square foot addition opening this year in the Brooklyn Navy Yard. Although they are a privately owned enterprise, they run a number of volunteer and educational programs and supply food to local markets. Gotham Greens is the newest addition to the Brooklyn landscape having installed rooftop greenhouses to grow food year-around in a hydroponic environment. Started in 2011, their farm supplies area supermarkets, including Whole Foods. Last Fall, Mayor Bloomberg announced a Green Building initiative as part of his ambitions PlanNYC program that includes rooftop gardens and farms. I wonder what it would take to green the rooftop of my building? Of course, this experiment will not even come close to meeting our actual food requirements. Even if we manage to miraculously produce two healthy heads of Kale, we’d still need about 48 more to cover what we consume in a year. But it will be fun, and give my children some idea of where food comes from. What are you growing indoors? This entry was posted on January 27, 2012, 11:00 am and is filed under Green, inspiration, Urban Homestead. You can follow any responses to this entry through RSS 2.0. You can leave a response, or trackback from your own site. All of the illustrations in this post are so fun to look at and contemplate! I love the idea of vertical farming – this is something i am definitely going to have to investigate further! I wish i had a 36 hr. day! love your blog. Thanks. I could use a 36 hour day, too! sigh. Awesome post from Domaphile about the importance of buying local, and reducing our carbon footprint! Thanks! It’s something I would definitely like to explore further. Great infographic. My acre in the country isn’t enough. I can only guess my condo balcony will also not contain wheat nor goats. Almost half of the food that reaches American consumers is thrown away as trash. Composting is a way to convert that trash into a resource.